NAPLES, FL. – Yes, Naples is one of the most beautiful cities in the United States. And, yes, it has one of the best year-around climates. Temperatures were ideal for the entire month we stayed there. This winter hotspot in southwest Florida has plenty to entice you. Good restaurants are in ample supply (though on the pricy side). The Dock, Turtle Club and newly-opened Masa – a very different type of Mexican place – were our favorites. Campiello’s wasn’t bad, either. A two-hour bus tour of the area introduced to some beautiful homes and a wide range of tourist attractions. And then there was, of course, the golf. 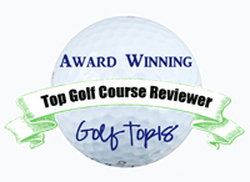 The Naples area lists 91 courses, and we played 10. Sarasota, the winter retreat of a year ago, is only two hours away but the golf was preferable there. It’s not that Naples golf was bad, but it was different. 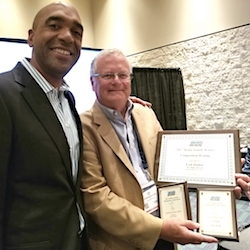 Our goal – as is always the case on our travels – is to play a wide variety of places and that means looking for the best values. No matter where you go, it’s nice to learn about a new area at least in part by playing its golf courses. In Naples that wasn’t so easy. In-season prices were discouraging, for one thing. And it seemed like most of the courses wanted to be considered private – but most weren’t. You could call and frequently get on. 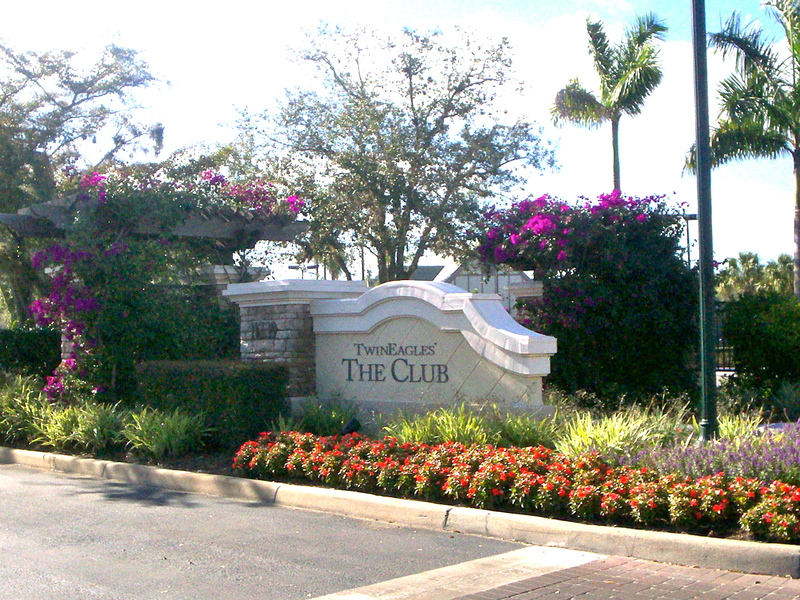 There was a striking similarity to their entrances, be it Heritage Bay, The Quarry, Naples Heritage, TwinEagles (see photo above), Bonita Bay. And the holes generally had fairways with lodging on one side and water or more lodging on the other. One local that I played with said – without malice – that they looked like bowling alleys. Truthfully, that wasn’t so much a negative as it was a general description of how things are. Thank goodness for the availability of golfnow.com. Not sure we could have played golf the way we like to play it without that website. 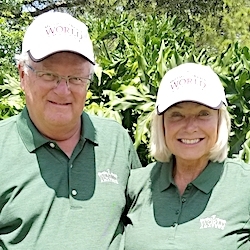 We enjoyed our condo in one golf community (Heritage Bay), but never could wangle a tee time there — though the 27 holes available were at least nominally open for public play (it was a new golfnow.com offering) and clearly not in full use. The most notable round of our stay was the last one – at TwinEagles, a 36-hole private club with an enviable history. In 2012 it hosted events on two of the major world tours – the Ace Group Classic on the Champions Tour and the CME Titleholders Championship on the Ladies PGA Tour. Jack Nicklaus designed TwinEagles’ Talon course, which was being prepared for the Champions Tour return in February. The Champions circuit played an event on the Talon from 2002-06 and returned in 2012. It produced some great winners – Hale Irwin, Loren Roberts and Kenny Perry among them — and Tom Watson was a runner-up there three times. We played the Eagle, originally known as the Aerie course designed by Gary Player. Steve Smyers, who did a great job in renovating the South Course at Olympia Fields in recent years, completed a remake of the Eagle in January of 2012 and it hosted the LPGA event 11 months later. The Eagle was much different – in a most positive way – from all the other courses we played in Naples. For one thing, virtually every green was significantly elevated (see photo above). I don’t know if I’ve ever played greens so large and so undulating. Using the putter from far off the putting surfaces was a good option on many holes (see photo below). The style took some getting used to, but it was refreshing. Of the other courses we tested only three billed themselves as “public.’’ ArrowHead, designed by the respected Gordon Lewis, was the best value (and the only course we played more than once). Valencia was fine, too, and those two layouts were also the most welcoming. Though they declared themselves public, they, too, were built within housing areas. Hibiscus was the other self-declared public layout, and it was the only free-standing (not connected with a specific residential area) one. Hibiscus had a cheerful new clubhouse, well-done yardage book (not a given at the Naples courses we visited) and the most memorable hole – the challenging par-5 14th which featured a shot to the green over a pond lined with beautiful bougainvillea. The flowering hibiscus was a feature throughout the layout, which was built in 1969. Other than TwinEagles, the course that stood out the most was Panther Run. Its name seemed a secret, as its signage more clearly identified the layout more as part of the Del Webb community in the most interesting little town of Ave Maria rather than by its designated name. A preseason training base for soccer’s Chicago Fire, Ave Maria is a small, upscale community with a big church as the centerpiece. Not only does it include the Del Webb community for retirees, it also includes a small college campus. The golf course – another Lewis design — was a cut above the others on our menu of those reasonably priced. It had wide fairways and could be stretched to 7,532 yards – very much a fun track to play. The first course we played was also one of the better ones. Herons Glen was part of a bustling country club setting in the nearby town of North Ft. Myers. Perhaps the prettiest layout was Spanish Wells, in Bonita Springs. It had three nines, which is always a big plus. The South, the first nine we played, had extremely tight fairways and our cart went dead on the seventh hole. It took an unusually long time for staff personnel to rescue us, so that bad experience detracted from our appraisal of the facility. 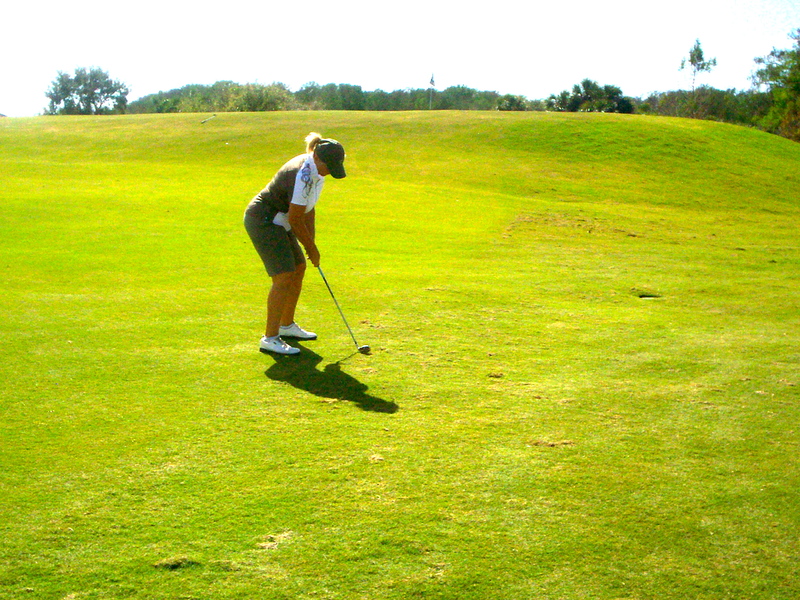 Lely Resort also had more than 18 holes. 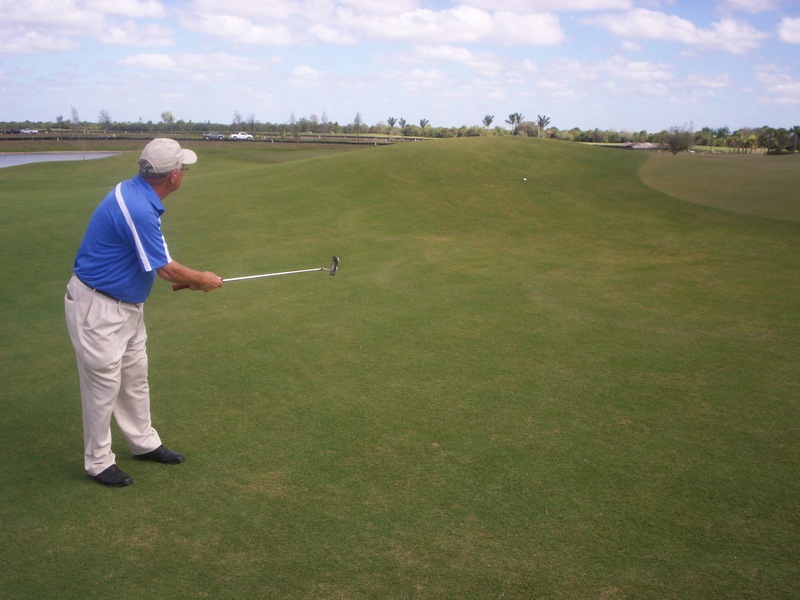 It had two 18-holers, and we played the Flamingo Island Club – a fairly challenging layout that had the same rating (75.1) and slightly higher slope (138 to 137) than its companion, the Mustang course. Quail Village was also a tight one, and its space was limited. The course played 4,873 yards from the back tees. One striking thing about our overall golfing experience in the Naples area was our playing partners. Of the three couples we were randomly paired with, all were from outside the United States. Two were from Montreal and one from Munich, Germany. All were very nice people and added some special memories to this golf getaway.